On 05-MAR-14, in the new animal room on the tenth floor at ION in London, we test reception in an IVC rack with and without the radio-frequency isolation chamber shown below. Each cage is for one or more mice, and has a metal grating to hold food pellets under the lid. Figure: IVC Rack with Isolation Chamber. We have a sheet of copper taffeta fabric on top and bottom. 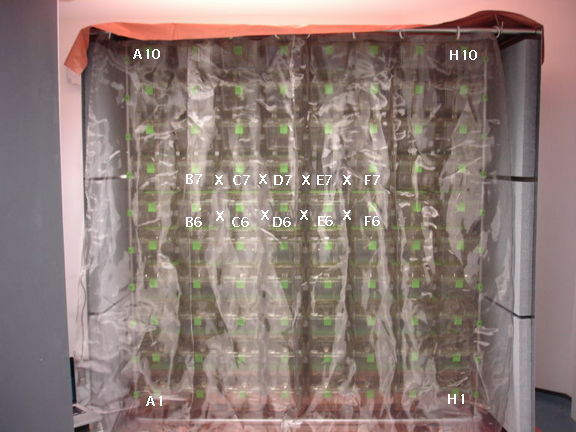 Behind and to the sides are walls of AN-77 absorbers backed by aluminum sheet. In front is a curtain of steel mesh fabric. Antennas are at locations marked "X". Cage labelling scheme as marked on the rack. We place the eight antennas of an Octal Data Receiver (A3027B) between the floors of cages B7-F7 and B6-F6. We measure reception in the rack by removing one cage and rotating and translating an subcutaneous transmitter (A3019D) on the end of a stick for one minute within the volume the cage would have occupied. We record the fraction of messages received. When the curtain is in place, we cut a hole in the curtain and pass the stick through the hole. Before we install the isolation chamber, we measure the reception in cage spaces as follows: E7 = 92.5%, E6 = 99.2%, E5 = 96.7%, F7 = 85.1%, B7 = 91.6%, E7 = 91.8%, D5 = 99.6%. After we install the isolation chamber we get: E7 = 100.00%, F7 = 100.00%, H1 = 100.00%. Without the chamber, reception is not quite good enough for reliable recording, even within 30 cm of two antennas. With the chamber, reception is 100.00% reliable everywhere.